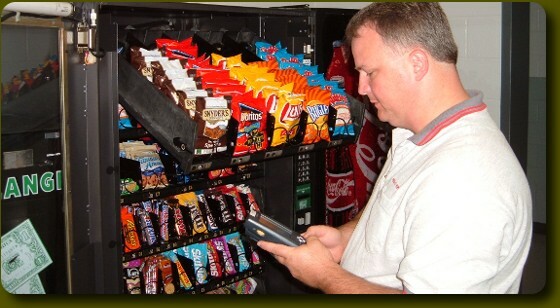 If vendors were able to service vending machines more often, they would be able to earn more money for their business. Do more; earn more. It is a simple formula, but it is not easy to execute, especially for vending operators. Optimal vending machine service is key to achieving vending success. When implementing vending machine service in the past, route drivers spend a few hours in the morning or the night before loading their trucks with product they might use on their routes the next day. When it is time to go on their routes, they head to their best selling machines first and move downward from there. When they arrive at a location, they head to the closest machine, check how much is needed to restock the machine and write it down, walk back to the truck and load the product into a container, then move back to the machine to load it up. If the driver is moving fast, it should take around thirty minutes to finish the vending machine service. Solving unnecessary vending machine service by route drivers has always been a challenge for vendors, but with Parlevel Systems’ vending management system (VMS), this problem is solved, and vendors’ businesses can become more efficient when they use it. The main issue with conducting vending machine service on a route that makes it so inefficient is having drivers go to machines that do not need servicing. With our VMS, vendors can see what machines need servicing on a specific route the night before and print out or upload into a GPS the route the driver needs to take. In this way, the driver can service more machines in a route and bring back more money. The other machines on the route will not be visited because there is no need to visit them. Increasing efficiency in this manner, a vendor can actually decrease the number of drivers because a small number of drivers can achieve more vending machine service. This decreases costs significantly. If four drivers cost $18 an hour to drive to 60 machines in a 10-hour day, then it would cost roughly $720 to pay them all to service a total of 60 machines. With the VMS, a vendor could reduce his or her employees by one driver and pay only $432 to pay 3 drivers for 8 hours to service 75 machines. They service more machines in less time because the VMS allow for pre-kitting, meaning that vendors will know what needs to be stocked before drivers go on their routes. Another idea to decrease costs would be to hire warehouse workers at $8-10 an hour to load the trucks at night for the drivers the next morning. This allows the vendor to spend less money on employees and move more product more efficiently. There are other ways to maximize profit in a vending business using our low cost VMS, and we will discuss many other innovative ways to get the most out of a vending business in future blog posts. Our vending management system can change the way vendors do business for the better. If you’re a vendor and are interested in learning more, please contact us at contact@parlevelsystems.com. Please keep in touch with this blog as we will be posting more interesting articles about technology, business management, and other topics related to the vending industry.